What do I need treatment for? Please note the information provided is intended to support patients and is not a substitute for medical advice and treatment. We strongly recommend consultation with your doctor or health care professional, before using any information obtained from articles of this website. As your vascular surgeon has explained to you, it was found that you have a medical problem related to a significant narrowing or stenosis of a carotid artery of yours. Carotid is the main artery on each side of your neck supplying this side of your brain with blood. The aim of the procedure is to prevent you having a stroke. The most well-studied and documented procedure for prevention of a stroke related to a carotid stenosis is carotid endarterectomy, which is the first choice. However, in your particular case, your vascular surgeon believes it’s safer to proceed with carotid artery stenting (CAS) instead. The reason may be either because you have serious medical problems which will put you at very high risk if you undergo major open surgery under general anaesthesia or because open surgery is expected to be too difficult (scars from a previous operation, radiation therapy in the neck or a short neck with restricted mobility). The physician will have probably asked you to discontinue for a few days (if you take) any anticoagulant like Warfarin or Sintrom, but you will not generally discontinue antiplatelet drugs like Clopidogrel (Iscover, Plavix) or Aspirin. Before proceeding with any interventional procedure (such as angioplasty or surgery), your physicians will generally require that a couple of blood units are available for you. In Greece, you need to personally liaise with the Blood Bank of your hospital in order that blood is secured for you. You will be asked to sign a form confirming that you understand why the procedure needs to be performed, its risks and that you agree to the procedure. You will be asked to be starved for 6 hours before the procedure and intravenous fluids may be administered to you as of the previous day to prevent deterioration of your kidney function. If you are allergic to the contrast material or iodine, you may be preventively given some medication to reduce the risk of an allergic reaction. 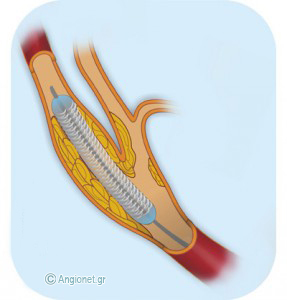 Carotid artery stenting (CAS) is usually performed under local anaesthesia. The anaesthetist will insert an IV to provide you with fluids and medications, and will connect you to the monitor. The vascular surgeon will choose where to insert an angiographic catheter, usually into an artery in your groin or near your elbow or even in the neck (this is the “access site”). Initially, your skin will be cleaned with an antiseptic solution and any hair in the area shaved to reduce your risk of infection. Your physician then numbs your skin with a local anaesthetic. Your artery is punctured with a hollow needle, a thin wire is advanced through the needle, and a catheter is passed over the wire guided to the desired location. Then, a liqid, called the “contrast”, is injected and the physician takes x-ray images that are projected on a video screen, a process called fluoroscopy, to see how the contrast is flowing through your carotid artery. The contrast causes a brief, mild warm feeling as it enters your bloodstream. You don’t feel the catheters in your arteries, because there are no nerve endings in them. As the wire is advanced, you will be closely monitored by the medical and nursing staff to confirm that this doesn’t cause you any problem. They may ask you to speak or to squeeze a small ball. Usually, the physician moves the x-ray table to follow the catheter as it is advanced through your blood vessel. Η αγγειοπλαστική με τοποθέτηση stent στην καρωτίδα γίνεται συνήθως με τοπική αναισθησία. Αρχικά, γίνεται παρακέντηση (συνήθως) της μηριαίας αρτηρίας στη βουβωνική περιοχή και προωθούνται ένα σύρμα (συρμάτινος οδηγός) και μικρής διαμέτρου καθετήρες διαμέσου αυτής της αρτηρίας προς την καρωτίδα, όπου γίνεται έγχυση σκιαγραφικής ουσίας και λαμβάνονται ακτινογραφίες (αγγειογραφία της καρωτίδας). Δεν αισθάνεστε καθόλου τους καθετήρες, όπως προωθούνται μέσα στις αρτηρίες, επειδή δεν υπάρχουν απολήξεις νεύρων μέσα στις αρτηρίες. Καθώς το σύρμα περνάει διαμέσου της στένωσης, θα σας παρακολουθεί στενά το ιατρικό και το νοσηλευτικό προσωπικό για να επιβεβαιώσουν πως αυτό δεν σας δημιουργεί πρόβλημα. Μπορεί να σας ζητήσουν να μιλήσετε ή να κουνήσετε το χέρι σας. Κάποιες στιγμές θα μπορείτε να παρακολουθείτε την πρόοδο της επέμβασης στο monitor της τηλεόρασης. Then, a special catheter over a wire is passed through the blockage site in the carotid. This has two functions: one part of the catheter is a cerebral protection device, preventing emboli (debris of plaque and clots) to reach the brain, and the other part of the catheter has a deflated balloon with a compressed metal stent around it. The balloon with the stent is carefully placed into the carotid blockage. Then, the balloon is inflated and the stent expanded to fit the widened (dilated) artery. This very moment you may feel some temporary discomfort in your neck and dizziness, because stretching of the carotid may cause blood pressure drop. After the artery is open, your physician removes the catheter with the balloon attached. Finally, an angiogram is performed to confirm that the artery has opened adequately and the stent is in the right position. Following the procedure you will be transferred back to your normal ward for observation. The nursing staff will monitor if you can speak normally and move your limbs normally. Your physician will advise you to take a rest for a few hours, and explain to you when you can safely get off your bed so that no bleeding or wound hematoma (collection of blood clots) occurs at the access site. You should be able to drink and eat again within a few hours. Most people stay in hospital until next morning when they are discharged. You may return to your normal activities when you feel ready. If there is an ecchymosis, or bruise, at the access site in the groin or arm, this will go away within a couple of weeks. You will also be recommended to continue taking Aspirin and/or Clopidogrel (Iscover, Plavix), as you almost certainly did before the procedure. Although carotid artery stenting significantly reduces the risk of future stroke, the procedure does not stop plaque build up. To preserve its success, you should seriously consider changes that will help avert the chances to further damage your arteries. If you don’t, you are at increased risk for a heart attack, a stroke or problems with the circulation to your feet.